There are 3 main types of solar system setups that people can opt for when venturing into the solar market. Let’s break these 3 systems down so you can understand which system may be better suited for your property and circumstances. Grid Connected Solar PV Systems are the most commonly installed systems. These systems are connected to the grid and do not require a battery system. However it is possible to add a battery system to your Grid Connected System, post purchase. If you have a Grid-Connected solar system, any generated energy you use is essentially free. Any excess energy is sent to the Grid (unless you have battery storage) and you will receive reimbursement in the form of a Feed-in Tariff (FIT). TIP: Batteries such as Sonnen, Tesla Powerwall 2, Senec and Enphase can be added to any existing system regardless of the existing solar inverter. 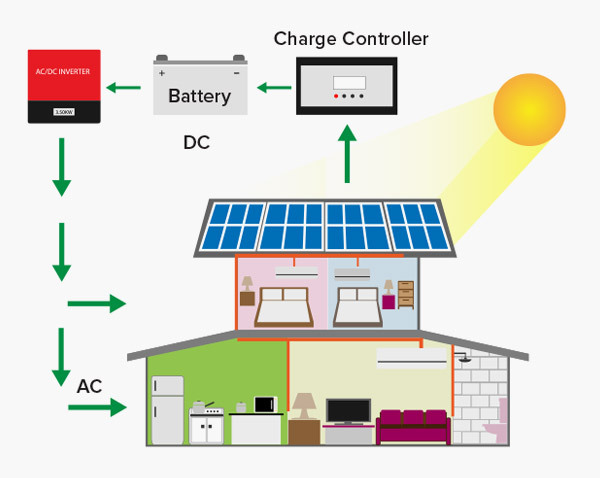 A Grid Connected Solar PV System with battery is sometimes referred to as a Hybrid System. This system stores the excess energy generated by a Solar PV System for the home to use when the solar panels are no longer generating electricity from the sun. A battery prevents the need to use grid energy if you have accumulated enough during the day to run your home at night. The added benefit here is if the system has not generated enough energy to use during this time, it can use energy from the grid as well. An “Off Grid” Solar System, is also called a ‘stand-alone’ system. This system is not connected to the grid and requires a battery system. Off Grid Solar PV Systems are rare and usually only found in rural areas that have difficulties connecting to the grid. These systems must be designed to be able to support enough energy and storage to meet the needs of the home or property month to month. A Backup Generator can be put in place in case the Solar PV System is not generating enough electricity due to weather conditions at certain times of the year. Off-Grid systems and setups are substantially more expensive than Grid Connected systems. The system, batteries and back-up generator can set you back over $30,000. To be able to go Off-Grid you’ll need to go rural or have a large block of land to accommodate for the system. Your local council and Distribution Network Service Provider (DNSP) may need to provide permission dependent on your location. If you know which solar system set-up you’d like to install or need to ask an expert, get 3 Obligation FREE Quotes from installers to compare prices and systems!